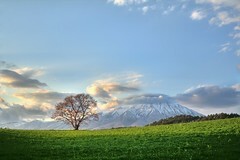 There will be GrabPERF downtime on May 29-30 2009 as Technorati completes its colocation relocation process. [here] There is no set time for the outage or its length, as the machines have to be physically relocated to the new datacenter, and then integrated into the new network configuration. I will be contacting the agent locations in the next few hours to update them on this maintenance. UPDATE: GrabPERF returned to service as of 23:40 GMT on May 30 2009. Thank you for your patience. Last Tuesday, I created a Windows 7 RC virtual machine for VMWare Fusion. As a fairly technical user of operating systems and the like, our internal IT department figured that I would be the right person to put this new OS through its paces. Unlike a lot of people who are using Windows 7 and commenting on the new features and functionality, I am here to comment on how well it works with someone who is ingrained in a Windows XP workflow to get his job done. As a virtual machine (2 processors, 1GB RAM, 40GB disk), Windows 7 is not as resource intensive as Vista threatened to be, and is just as responsive as my XP virtual machine is with the same machineÂ configuration. Subtle changes to the Start Menu and the Task Bar are easy to adapt to, and so far all of my applications run smoothly (I am using mainly Microsoft applications, so this should not be surprising). My virtual machine doesn’t have an Aero compatible video card, so I don’t get all of the cool transparencies and visual effects, but frankly those are eye-candy. I need an OS that just works, and so far, Windows 7 lives up to expectations. The most surprising thing is that there are no surprises. Building on 2-3 years of Vista development and improving the performance means that most applications already run efficiently. The only complaint I suppose is that the OS takes up a very substantial amount of the 40GB disk. However, as this is not the OS where I store media, pictures, etc., I am not as concerned as I would be if this was my primary computer. That said, on an old Dell Latitude D610 (60 GB disk, 2 GB RAM, single core processor carved by cavemen) that I installed this the same OS on, it is running fine, except for a large amount of fan action that I didn’t hear when the same machine was running Ubuntu 9.04. As well, this older machine has no apps on it, other than Skype, and it has a large amount of the 60BG of disk still left. Overall, as a day-to-day user of Windows, I am satisfied that Windows 7 is a giant leap over Vista, and I am looking forward to migrating my work permanently to this OS. Since its GA release on March 19 and its addition to Windows Update in late April, Internet Explorer 8 has been gradually increasing its market share in the US. Based on the current growth pattern in StatCounter’s GlobalStats data, it appears that Internet Explorer 8 will overtake Internet Explorer 6 sometime in late May or early June. In other parts of the world, the adoption of the new version of Internet Explorer is substantially slower, and affected by regional differences in the browser population. 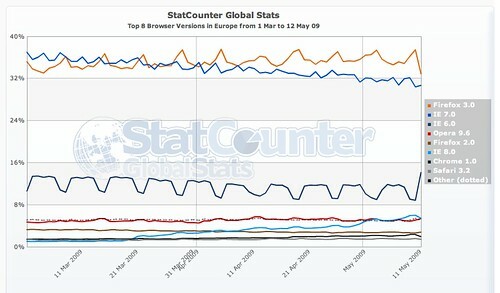 Europe is notable in this as MSIE8 has just overtaken Opera 9.6 in the browser population in the last week. 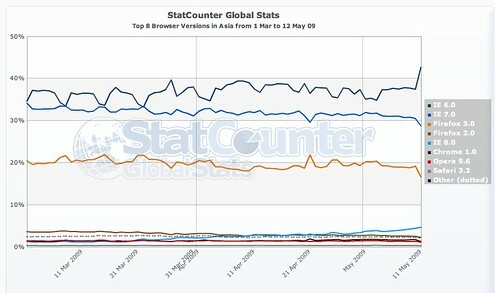 In Asia, Internet Explorer 8 has moved into fourth in browser share, but is a substantially lower percentage of the population than the top three browsers. In a frightening statistic, Internet Explorer 6 is the most popular browser in Asia, indicating that path to adoption may be longer in this region. Overall the adoption of this new browser as a replacement for Internet Explorer 6 and 7 is slow and steady. MSIE8 does not appear to be significantly cutting into the Firefox population, but this could change as people begin to hear more about the features of the new browser, and Web sites begin to be designed to its features, rather than those of MSIE6 and MSIE7. At CNet News today, the article What browser wars? 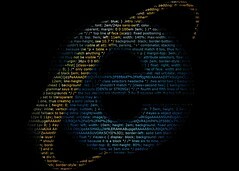 The enterprise still loves IE 6 nicely sums all the reasons that Internet Explorer 6 is still in use in enterprise environments. The dominance of Internet Explorer 6 in the workplace is something I discussed a few days ago, supported by the pattern of higher weekday use of this browser during the work-week. Limiting employees to a browser that is considered an ancient technology by Web developers poses an interesting dichotomy to companies. Internally, they are powering their internal applications with coal and steam, and turning the cogs of business with leather drive-belts. Externally, the customers get to see a site that is shiny, one that has all the gadgets of a rich-Internet application that require the computationally advanced capabilities of a modern browsers. To some extent, the companies who use Internet Explorer 6 internally are saying to their employees that the Internet is simply another desktop application that they must use. I am firm believer that the Web will be the home of many of the applications we use on a daily basis in the very near future [here and here]. My vision of this is that the Web application is designed to free the user, and lessen the workload for IT departments. Most organizations continue to see the Internet as a negative, a threat to productivity, a necessary evil. So if they restrict their employees and provide them with a browser that doesn’t quite work properly on the Internet, they still have ultimate control. I have had the benefit of working for organizations throughout my professional career that did (do) not limit my choice of browser or operating system, allowing me to find my own preference. I realize that this is rare in corporate Industrial Culture, and I consider myself lucky. So, why is their still a need for Internet Explorer 6? Frankly, there is really no need for it in my opinion, and the CNet News article has a table from Forrester that supports that. That doesn’t mean that my browser idealism and utopian dream of “may the best browser win” will hold any sway over the IT decision makers in large organizations. 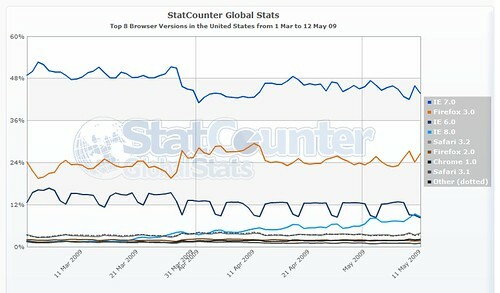 StatCounter still shows that during the week, Internet Explorer 6 holds 12% of the browser share in the US [here]. So, will this 12% of the browser world hold back the promise of the Internet for the rest of us?